The Cipher Disk: First a bit of “technical discussion” Cipher versus Codes- In non-technical usage, a “(secret) code” typically means a “cipher”. Within technical discussions, however, the words “code” and “cipher” refer to two different concepts. Codes work at the level of meaning — that is, words or phrases are converted into something else, such as "Dots and Dashes" of the telegraph or the "Left and Right" movements of the signal flag. An example of this is the Telegraph Code, which was also used to shorten long telegraph messages. Ciphers, on the other hand, work at a lower level: the level of individual letters, small groups of letters, or, in modern schemes, individual bits. 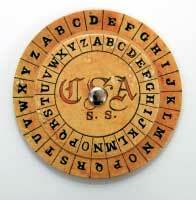 Some systems used both codes and ciphers in one system, to increase the security. In some cases the terms codes and ciphers are also used synonymously to substitution and transposition. Historically, cryptography was split into a dichotomy of codes and ciphers; and coding had its own terminology, analogous to that for ciphers: “encoding, codetext, decoding” and so on. Decode = to convert (as a coded message) into intelligible form : to recognize and interpret a system of symbols (as letters or numbers) as to their assigned meaning. Cipher or Cypher = a method of transforming a text in order to conceal its meaning. Decipher or Decypher = unlock the meaning of, re-transform text to reveal its meaning. Encrypt or Encipher = Converting a message into a cipher. Decrypt or Decipher = Converting a ciphered message to it original state. 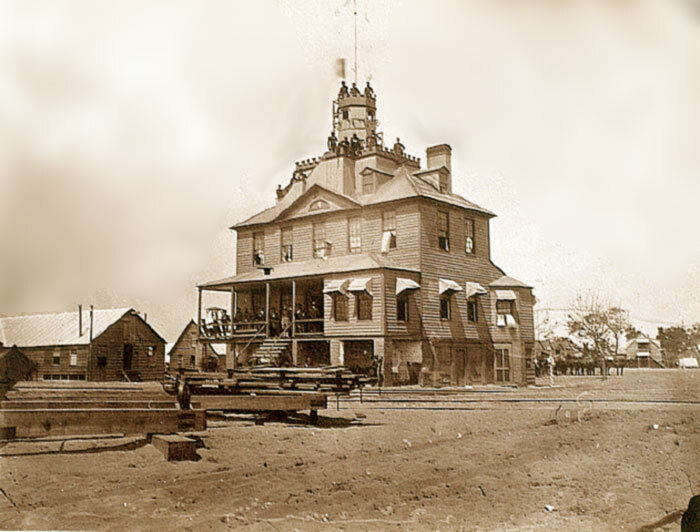 During the Civil War, if signals were to be displayed in the presence of an enemy, they were guarded by ciphers. These ciphers were capable of frequent changes. The rules by which these changes were made, had to be simple. Ciphers are undiscoverable in proportion as their changes are frequent, and as the messages in each change are brief. When alphabet ciphers were used, the aim was to never allow any letter to appear twice alike. The number of letters under each key was also to be as small as possible. The termination of words were to be concealed, and letters in each word would have been made in an unusual sequence. Messages to be enciphered may be wholly reversed, that is, written with the last word first or written only with each word reversed, or a combination of the two. Simple devices, as described below, made it possible to exhibit signals so that their interpretation to the enemy was impractible, if not impossible. The entire code changing every day, with every message or with every word. 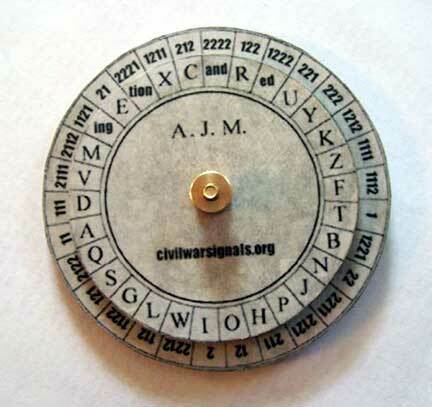 The Confederate Cipher Disk: (A Polyalphabetic cipher disk), was a mechanical wheel cipher consisting of two concentric disks, each with the 26 letters of the Latin alphabet, that was used for the encryption of messageges. It was created by Francis LaBarre and was based on the Vigenère Cipher. 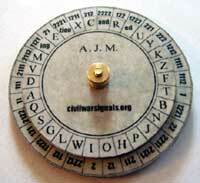 The Confederate Cipher Disk is made of brass. The outer disk has a diameter of approx. 2 1/4 inch, whilst the inner disk measures approx 1 1/2 inch. On each of the disks, the alphabet is written out clockwise in the usual order (A-Z). The disks share a common axle, so that the inner disk can be rotated. The smaller disk carries the text CSA SS. CSA stands for Confederate States of America, while the SS is most likely the abbreviation of Secret Service (*). At the rear is the inscription F. Labarre (the creator) and Richmond VA.
Not many real Confederate Cipher Disks have survived and there are only five known to exist today. Two of these are in the hands of private collectors, one is part of the collection of the Smithonian Institute and two are at the Museum of the Confederacy in Richmond (Virginia, USA). The Union (Federal) Cipher Disk: The object of this invention is to afford means whereby persons within signal distance of eachother can communicate intelligibly by certain movements of flags or other objects, and a sytematic arrangement of letters and numerals or other characters upon movable and stationary disks, without the possibility of having their messages detected by others.~ Albert James Myer. Description of the "Signal Disk": was approx 3-3/4 to 4 inches in diameter and made of heavy card stock, or other material. It consisted of two concentric disks of unequal size revolving on a central pivot. The disks were divided along their outer edges into 30 equal compartments. The smaller inner disk contained letters, terminations and word pauses, while the outer disk contained groups of signal numbers (On some disks, for easier recognition, the number eight represented two. This was because the eight would be upright in most positions of the disk.). The initials A.J.M. represent the Chief Signal Officer General Albert J. Myer. Each disk had a control number used for accountability and sychronization. The disks are fastened concentrically together in such manner that one may revolve upon the other, and that they may be clamped tight in any position. They are of such size that when fastened, the letters, etc., upon the inner disk, will each appear close to and directly opposite one of the combinations upon the outer disk. Various disks with various combinations of order were utilized and by the use of the control number, synchronized between parties. Thus, in this case, to make "T" the combination "1" or "one" is signalled; to make "E" the combination "21" or "two, one" is signalled; to make "S" the combination "121" or "one, two, one" is signalled; to make "T" the combination "1" or "one" is signalled; to make "ING" the combination "1121" or "one, one, two, one" is signalled. And there - the word "TESTING" is so signalled. To indicate the end of the word, the common "3" or "three", may be used, or whatever combination may be in the compartment opposite the character for "end word", should one exist on the control numbered disk being used, this being arranged in advanced. Now, it is evident that with any change of the relative positions of the disks made, by rotation, the whole code of alphabetic signals is changed. Thus, suppose the inner disk is rotated until the letter "A" is opposite the combination "2122". Now, the word "TESTING" would be signalled as "1112, 1121, 1122, 1112, 2112, 3,3,3" (three-three's indicating end of message). The signals do not in any way resemble those before exhibited for the same word. These changes can be indefinitely varied. It is for making them that the disks are both movable and changable. Where different parties, as officiers of a corps or army, are to be in communication, rules for the changing of the disks would be issued to all, enabling each to use them, whenever the officers are in view of each other; each finding that his cipher will then correspond with that of the officer with whom he is signalling, although they may never have met. The following is an example of a general rule for the use of signal disks. The signal disk, in this example (as well as above) is supposed to be arranged for a code of two elements, and both communicating parties having exacting disks. The signal to indicate that a "Cipher follows" is made by three circular waves of the flag or torch from left to right, and with this motion -the preceding message will ALWAYS be a cipher message. Other methods for indicating a cipher message can be beforehand preconcerted, an example being a stutter code of "C, C", to indicate the start of a ciphered message. Explanation of the Signal Disk. The numerals on the outer rim of the disk represent the combinations to be made with the flag, torch, or by telegraph using the "general service code". Each combination represents, when made, that letter on the inner disk which coincides with it. To make Signals. The signals, for whatever code may be represented by the symbols upon the outer disk, are made according to the general rules of signalling, taking in account for the different codes. The Adjustment-Letter. The Adjustment-Letter is any letter selected on the inner disk, which, placed opposite a given combination or key-letter, on the outer disk, adjusts the disks for the cipher, and is the key to any communication sent in that particular cipher. The letter R is understood to be the default adjustment-letter, if no other letter is given. The combination to be used with the adjustment-letter is called the key-number. The adjustment-letter and the signal combination (key-number) being given, the inner disk will be turned so that the letter will coincide with the combination (adjustment-letter and key-number) given. EXAMPLE: The combination is adjustment-letter "R" and key-Number "1212", the inner disk will be turned so that "R" will coincide with "1212". Any letter may be the adjustment-letter (R is the default adjustment-letter, if none is given) Any signal combination may be chosen for the key-number as well. EXAMPLE: The signal "2212, 3, 1122, 333," would indicate that "W" was the adjustment letter ("2212" being "W" in the non-ciphered code) and "1122" the key-number completing the cipher combination. The disk in this case would be arranged so that "W" would coinside with "1122". To send a Message in a Cipher. Station "A" calls station "B" and gets "B's" acknowledgment. "A" gives "B" the cipher combination in which he intends to send the message. EXAMPLE: "A" gives "B" "2122, 333"; "B" answers by giving "11, 11, 11, 3, 2122, 333"; which indicates to "A" that "B" got the message and understands the proper signal-combination to be the default adjustment-letter "R" (since one was not given) and the key-number to be "2122". Both stations "A" and "B" would then adjust their signal-disks as follows; each turns the inner disk so that the letter "R" will coinside with the combination "2122" in the outer disk. The disks of both parties are now alike, and the message commences. To signal the word "pickets" in the foregoing cipher, using the disk on this page, station "A" would make "221, 222, 1122, 2112, 2, 2221, 1, 3" = "pickets". If "W" was the adjustment-letter and "1122" the key-number, making the cipher combination "W - 1122", "W" would coincide with "1122" on the disk and the word "pickets" would be presented by "12, 112, 122, 1112, 1211, 22, 11" = "pickets".